Most people in the Fränninge- and Vallarum-region who on this cloudy day turned their heads towards the sky and followed the wobbly journey of the large bomber realized that something was not right. Only two of the four engines worked and one landing gear was hanging half way out. The plane came from the 91st Bombardment Group out of the American 8th Air Force, generally known as "The Mighty Eight". Just then this aircraft was not so mighty. The plane, nicknamed ”Lackin Shackin” was flown by the pilot 1st Lt. Frank C. Amman, who at the controls fought a desperate struggle to find a suitable place to set down the dying bird. 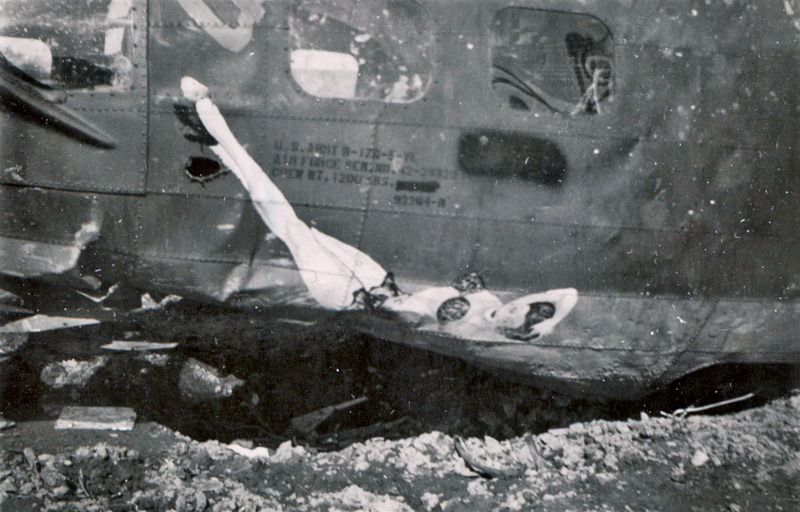 The fact that Lieutenant Amman was left alone aboard was simply that he just a while before accidently had triggered his parachute inside the plane. It was just after one o´clock and down on the small farms people were at best preparing dinner. Mother, father and all the small children looked anxiously to the sky. One thing was certain, it would be a dramatic afternoon. 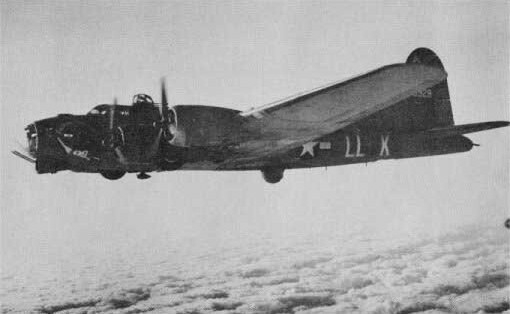 ”Lackin Shackin” was part of a force of approximately 900 American bombers who were on bombing missions at the German city of Cottbus located about 100 kilometers southeast of Berlin. Departure from the target was due north along the River Oder. 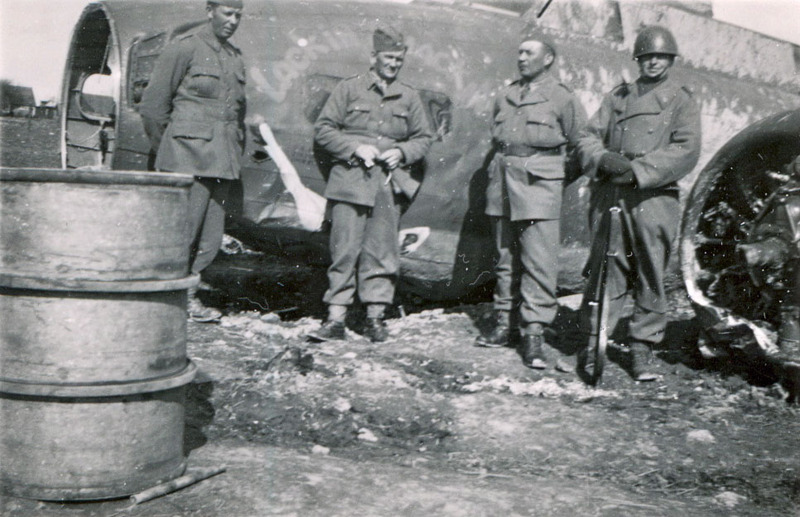 During the flight over German territory the group was exposed to anti-aircraft fire and ”Lackin Shackin” received hits in the engines. At a point about 50km southeast of Bornholm the plane was seen to leave formation and at the same time lose altitude. Shortly after noon, 12:00, the plane flew in over Swedish coast at the height of Simrishamn, where it was shot at by the Swedish air defense. Frank Amman now plotted the course for the military airfield at Sövde. 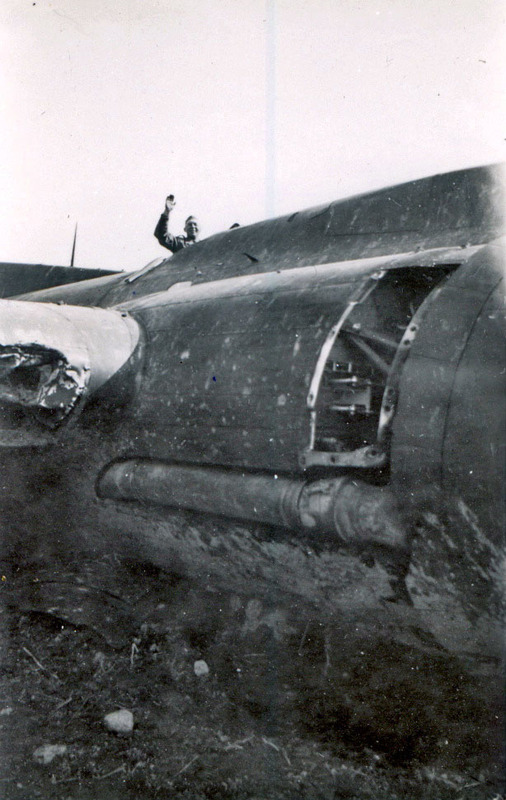 Minutes before ”Lackin Shackin” approached Sövde the anti-aircraft crew had just shot down a German twin-engined Messerschmitt Me 410 fighter. One can understand the nervousness of the Swedish crew. It could be carved with a knife. 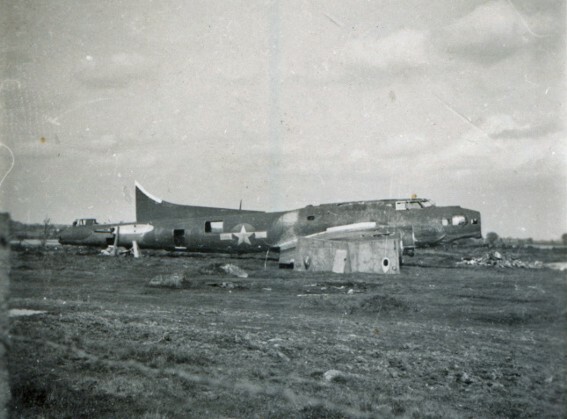 To this fact must also be added that Sergeant Jacobsson, in charge of support-point 5B at Sövde Field, recently had received a report from the command center that American planes could be fired upon. The crew fired away 25 warning shots with their 40 mm anti-aircraft gun and finished off the salute with two rounds ”probable fire for effect whereas smoke seemed to burst from the plane”, as Sergeant Jacobsson later reported at the hearing on the defense staff. Possibly Jacobsson was wrong. One crewmember from ”Lackin Shackin” would cast out flares at this time. – Why are they shooting at us?.. We want to land!! To the already prevailing chaos on board was now confusion. Frank Amman orders his crew to leave the plane by parachute, and somewhere between Tågra och Lövestad nine chutes are now seen floating down towards the soil of Scania. Co-pilot Frank Logan Butler broke a foot on impact, another landed on a church roof but slipped down without a scratch. The rest landed unharmed. 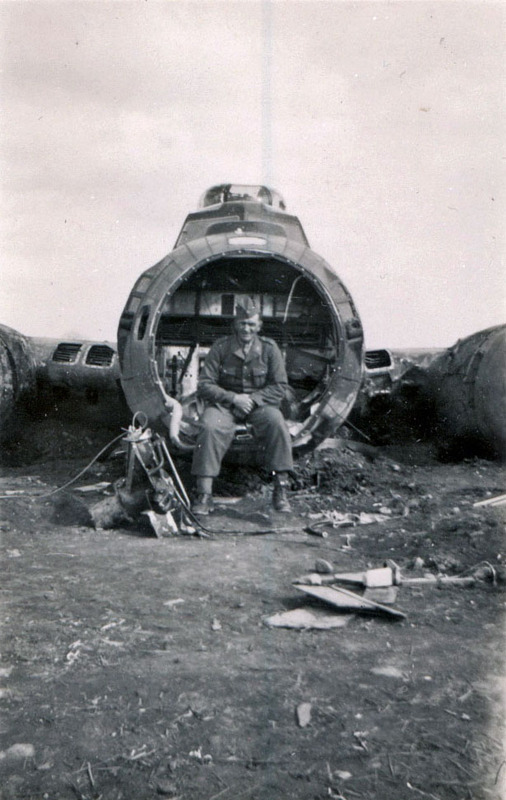 The ballturret-gunner Irvin Kennedy was imediately invited for lunch at a farm nearby. The navigator Harold A Levin ”was captured by a militia boy” according to the report from April 15, 1944. This photo was taken by Evert Persson, born in Vallarum. There was a photo ban in place, but Evert who was 12 the the time, took this picture the day after at an ungarded moment. 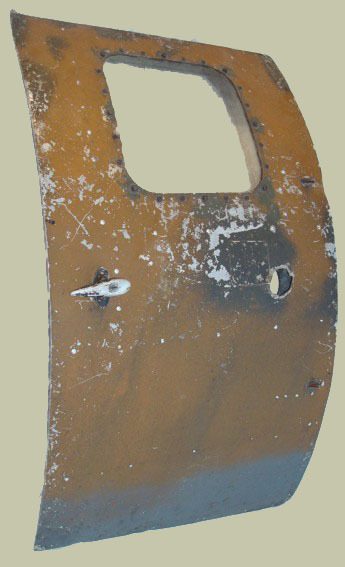 Not only the crew left the plane in the air, so did the entrance door located at the rear of the plane´s right side. Since this opening would allow escape in case of a bail-out it was designed to easily come off. This was so that the opening would be as clean as possible when leaving the plane. In any case, the door fell into a field where it was lying until autumn -44. The landowner who eventually found the door did not hand it over to the military but decided to keep it as a souvenir. As we know the war ended the following spring and the door was probably forgotten about. Decade after decade passed and in the early 70´s it turned up at a merchant dealing in antiques and estates. 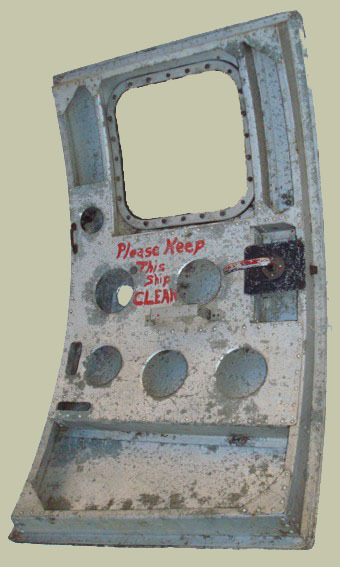 Aviation historian Thomas Sivhed found it there and saved it for posterity. It is now part of the FLC-collection. Sven Åke Svärd, Ystad, says: - When this picture was taken my dad Axel was 44 years old (the soldier wearing a helmet at the far right in the photo). He was called up several times during the war. I remember I was so fascinated by the fact that the Americans had painted a lady in a bikini on the plane. Dad told me there were lots of tinfoil strips in the plane. I think the pilots threw the tinfoil to confuse the air defense. Malte Olofsson, Fränninge was the first militia man who arrived at the site (although Malte didn´t have his uniform and weapon with him at the time). Malte is now deceased, the text is a memo from 1998. -We saw the plane make a big round to the north and east and then coming back from the same direction as before and suddenly belly-land with a violent crash a few hundred meters from us at the lands of Näsby Boställe in Tolånga parish. We saw gravel, stone and dirt flying high into the sky, which was explained by the aircraft plowing straight through a stone wall. We immediately ran there, but then the pilot had already run away from the plane to a nearby farmhouse. Once we reached the plane the pilot had returned and intended to enter the plane. As a Home Guard I followed duty, and without thinking of danger, I went up to him and prevented him from doing so. He now stood in front of the entrance, trew out his arms as if to dismiss curious people. He too out a cigarette lighter from his pocket as if he intended to set fire to the gasoline (perhaps according to given instructions). I do not remember all the details, but I think I took his arm and said ”Sverige” or ”Sweden”. He then took my hand and looked relaxed. 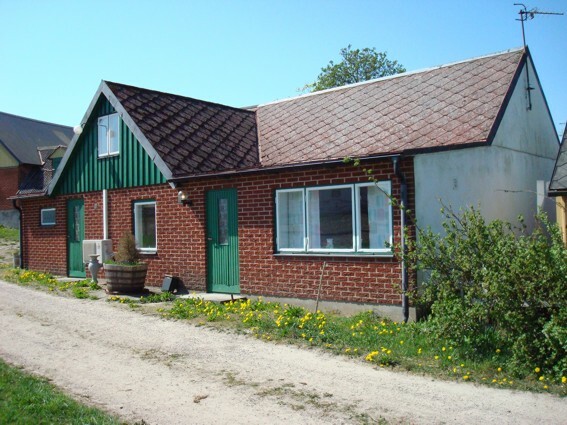 The house Frank Amman was invited to, for breakfast by the Emilsson family, after landing. 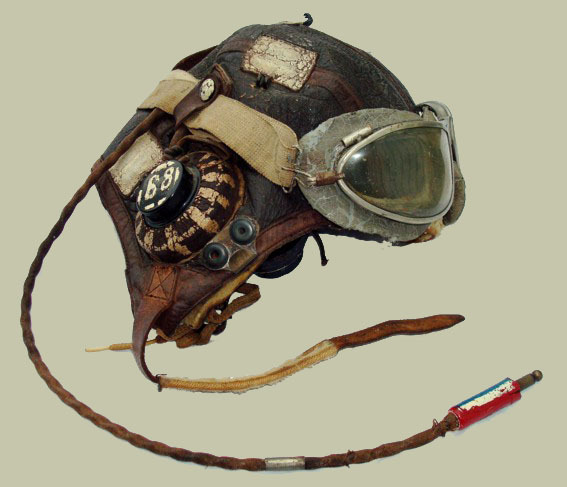 Frank Amman gave his leather helmet as a souvenir to the son of the house, Caj Emilsson, who at the time was 17 years old. Nicklas Östergren was presented the leather helmet as a gift from Caj's whife, Signe Emilsson who saved it all these years, and it is now part of the FLC-collection. Gudrun Svantesson, Staffanstorp: -It was so dramatic. I was 13 years old and went to school in Vallarum. When we saw the plane we all jumped on our bikes and cycled to the crash site. 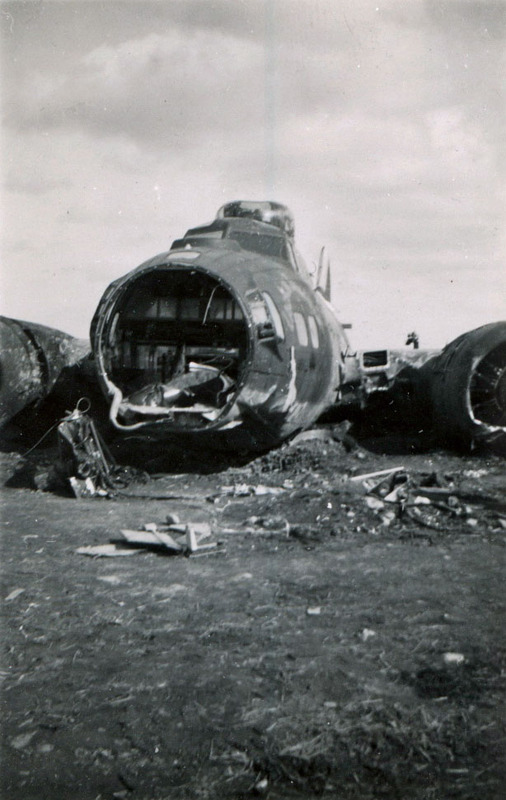 It looked awful, the ammunition was hanging out of the plane and fuel poured out of the damaged engines. I didn´t see the pilot, he had probably gone to Näsby Boställe (the Näsby´s residence) at that time. I remember my one year older cousin got a ring that one of the guys in the village made of plexiglass from the plane. The military managed to get the plane on its wheels and towed it to a pasture near Näsby Boställe. Gudrun took this picture a few days after the landing. The engines has been removed, as the fin and stabilizer. Next stop for the plane´s parts were a scrapdealer in Ystad, probably Persöner. Thanks to Leif Möller / Ystad Allehanda for the above article.